At the recent GrindTec 2018 exhibition, VOLLMER launched its new CHX 840 grinding machine. Capable of sharpening the tooth face and top of circular saw blades in one set-up, the machine is also tailored to the requirements of sharpening specialists and sawmill operators that have to continuously re-sharpen circular saws. In line with the trade fair motto ‘Shaping Success Together’, the Swabian specialist for grinding and eroding machines explains the functions and application possibilities of the CHX 840. VOLLMER had sharpening specialists, sawmill operators and furniture makers that process wood, aluminium or metal in mind when it developed the new CHX 840 grinding machine. The machine, presented for the first time at the Augsburg-based trade fair, is ideal for machining carbide-tipped circular saw blades with a diameter up to 840mm. The portfolio is complemented by a second variant, the CHX 1300, with which circular saw blades with a diameter up to 1300mm can be machined. 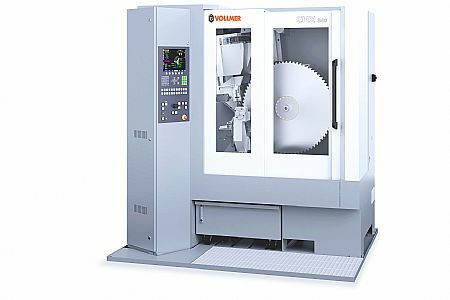 With five CNC-controlled axes, the CHX 840 can machine saw blades with all common tooth geometries. This also applies to sawing with axial angle and group toothing. Thanks to a double grinding wheel, the sharpening of tooth face and top is conducted in a single set-up, thus reducing the set-up times of the machine. A transverse feed pawl with pneumatic lifting also permits machining of clamping segments and clamping rings. 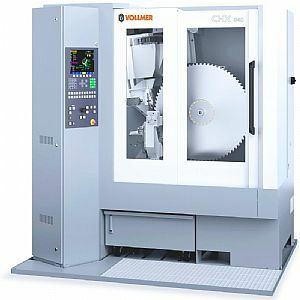 VOLLMER equipped the CHX 840 with different automation levels to reduce machining and set-up times. For example, the grinding machine has an optional automatic set-up process, which consists of running in the saw, the diameter detection as well as an acoustic sensor for touching. With the integrated sensor system of the feed pawl, the input of the tooth pitch is no longer necessary and the automatic setting of the hook and clearance angle avoids adjustment errors. The HS automation solution ensures automatic loading of the CHX in order to realise unmanned operation of up to seven hours. The programming and preparation of the saw blade stack is possible during machine operation. Thanks to a saw blade stack height of up to 180mm, the automatic machine loading can hold up to 25 circular saw blades. As saws are stacked with intermediate layers, teeth breaking and blade damage can be avoided. The machine is adapted to the individual needs of the customer with the different automation levels. The operating concept of the CHX 840 is based on the VOLLMER multi-function hand-wheel. This facilitates the selection and movement of the axes, which in turn avoids operating errors. The hand-wheel is also used as a potentiometer in order to carry out speed adjustments in automatic mode. The reinforced grinding motor with variable cutting speed ensures a high grinding performance on the carbide-tipped saw teeth. The machining times and surface quality can be improved with variable input of the grinding speeds during the sharpening process at the different areas. 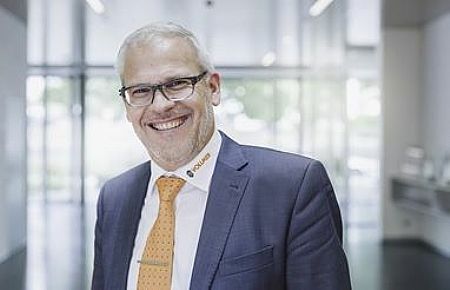 "With our CHX sharpening machine, we are closing a gap in our offer for machining carbide-tipped circular saw blades", states Dr. Stefan Brand, CEO of the VOLLMER Group. "The productivity and flexibility of the CHX also makes the machine a worthwhile investment for smaller companies."